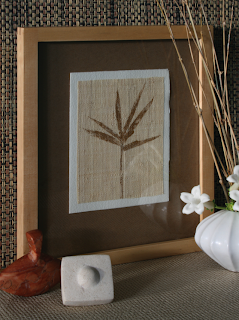 Above is a cluster of bamboo printed with gold and silver ink. 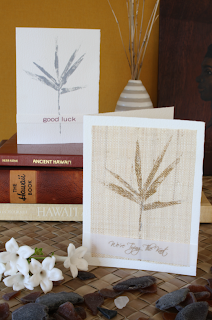 A few weeks ago I posted about my Pacific Weddings Magazine DIY Card Feature and mentioned I would soon be sharing some of the other designs I submitted. As promised, here are a few other ideas. 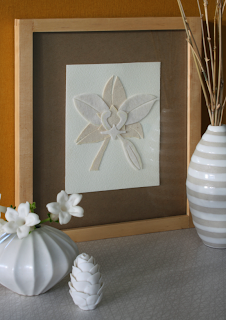 The entire concept was to make a handmade card that could then be framed as art. Once your recipient removes the "message band" they can then frame the card and have a beautifully handmade piece of art that they can admire for years to come. What's better than getting carded? Doesn't it always make you feel great? 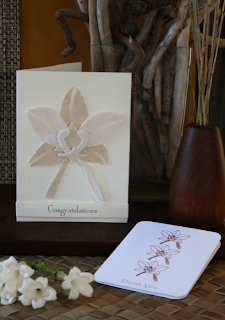 Here is a silkscreen thank you card with a wool felt and canvas 3-D orchid. you knock my hand-knitted socks right off. btw, have not found anything even remotely similar to your jar scraper:( but i'll keep on it!